One of Deere’s first training videos explains the special features of the Model “GP” Tractor. A company doesn’t reach 181 years without constant change. 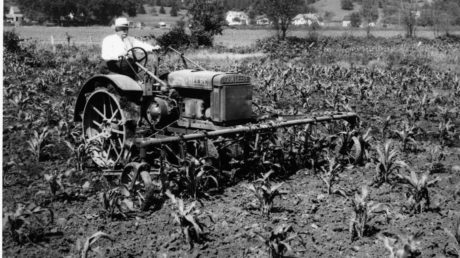 Like today’s evolution of precision ag products, John Deere customers in the early 20th century were experiencing a revolutionary change through mechanization. Horse-drawn implements were giving way to the productivity and efficiency of self-propelled tractors, combines and other agricultural equipment. The tractor sparked that change. The year John Deere began developing tractors in 1912, a mere 7,000 tractors were sold across the entire United States. But the transition from massive steam tractors to smaller, less expensive farm tractors, had begun. As power farming demonstrations canvassed the country and hundreds of entrepreneurs looked to introduce the next breakthrough in farm mechanization, the tractor was becoming widely adopted, as farmers realized its potential to make their work more efficient and profitable. John Deere introduced the Model “D” tractor in 1923, but work on a more versatile tractor was underway soon afterward. When the Model “GP” was released in 1928, it was the first tractor to offer four forms of power: belt, drawbar, PTO, and powerlift. In the coming years, the “GP” would go through a series of improvements to better serve customers. Deere & Company’s then Director of Advertising, Howard Railsback, was pleased to discover in the spring of 1926, an area school where the local instructor was “using some of our large wall posters to discuss the design and construction of farming equipment. The fact that he was using Deere posters was not only complimentary, but interesting to us,” Railsback said. 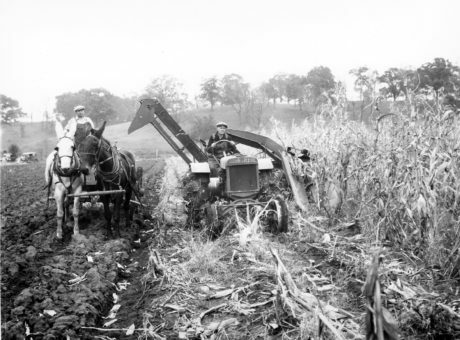 In 1928, farmers were still converting from horse to tractor operations, and many used both. Realizing an opportunity to promote John Deere equipment through expanded teaching material, the company went on to create a series of wall charts that evolved into a cloth-bound book made available free of charge to teachers across the U.S. The 157-page book covered such topics as preparation of seed beds, soil fertility, power on the farm, and equipment lines such as disk harrows, plows, grain drills, corn planters, manure spreaders and tractors. Some 70,000 copies were distributed in the first year. But there was a new medium that was beginning to capture the world’s attention: the moving picture. Like the tractor, the motion picture industry was in its infancy. The first feature film synchronized with audio, “The Jazz Singer,” was released in 1927. John Deere quickly recognized the value of moving pictures and included films at John Deere Day, an annual dealer preview that coupled equipment demonstrations with feature productions to introduce the year’s product line-up. One of John Deere’s earliest films, if not the first, debuted in 1929 or 1930 under the title “The Changing Picture in Farm Power.” A silent film with text to introduce each sequence, it was a valuable training tool to teach customers about the operation and repair of the new Model “GP” tractor. 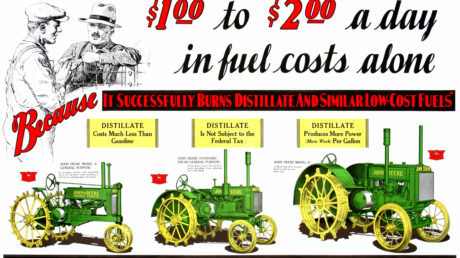 An advertisement promoting the General Purpose and Model “D” tractors. Take a look at some of the scenes from the film, including a demonstration of the GP’s unusual front axle flexibility, check row planting, attaching implements, and powerlift. “The Changing Picture in Farm Power” made one thing clear: the farm was becoming more productive and more efficient, and farmers were embracing “power farming” like never before. One hundred years after the introduction of the first John Deere tractor, that journey continues.